Home > Uitgevers > Steamforged Games Ltd.
verwacht: april 2017 - stretchgoals: najaar 2017 The Dark Souls board game is a brutally hard exploration miniatures game for 1-4 players. Prepare to die. The game features a "fast set-up, long reveal" mechanism that gets you into the game quickly and builds the location as you explore. The sense of danger is palpable as you discover new locations and the monsters that inhabit these dark places. The core combat mechanism and enemy behavior system forces deep strategic play and clever management of stamina to survive. 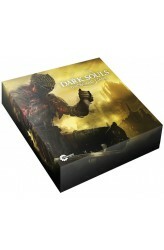 Dark Souls includes numerous boss and mini-boss encounters — including one against the Dragon Slayer Ornstein and Executioner Smough — and utilizes an innovative behavior mechanism so that no two encounters are ever the same, thus giving the game ..